Take the smart approach to K12 technology projects. Achieve your NYS district goals with our state-aided technology services. ​in school district facilities throughout Western and Central New York State. Select upstate NY school districts that rely on Archi-Technology to save time, optimize budgets and avoid pitfalls. Systems Design and Implementation Standards provide a district-wide strategic framework for technology system design and installation that save time and ensure quality. Archi-Technology provides direct, onsite services to NYS school districts and their Architects that are located in Regional Information Centers (RICs) in Central and Western New York State. Select the map to see a detailed view of these RICs. 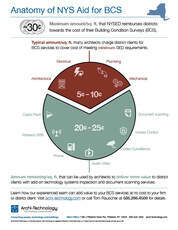 ​Anatomy of NYS Aid for Building Conditions Surveys. ​Is your school district leaving available state aid on the table that could be used to assess and document technology infrastructure and IP-based building systems such as instructional technology and security systems? View PDF. Free resources for your current or next K12 technology project.